As a child I experimented with many forms of art and throughout my life that passion has grown into my profession. I originally learned artwork from my mother, Lorraine Pfeil. While in college, I made my living primarily through sculpture, crafting jewelry, and drawing portraits. My art studies lead me to San Francisco, where I earned a living as a street artist. I moved to Western North Carolina for its rich diversity of plants and wildlife. My enduring desire is to represent the beauty of the forest and mountains in a manner that offers to others the peace and joy I experience in creating my work. 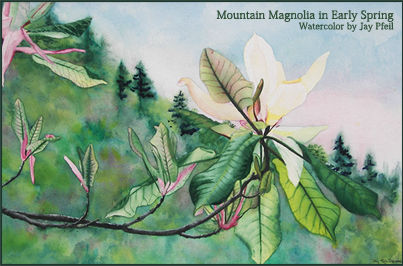 My primary medium is etchings and engravings, where I depict the natural beauty of Western North Carolina and other natural areas that have influenced my creative energy. Through my daily mountain hikes, I strive to etch or draw my work in their natural locations. 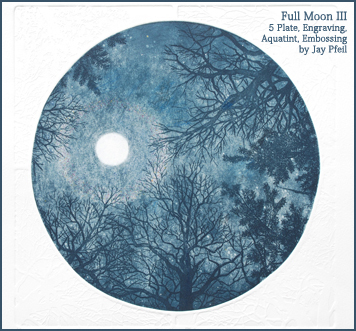 Due to the time-consuming and complex nature of etching and engraving, larger works are often finalized in my studio. It is my hope that conveying my enthusiasm and reverence for the wild world, that others may enjoy, respect, and conserve the environmental diversity that surrounds us in a sustainable, cooperative and joyful balance.